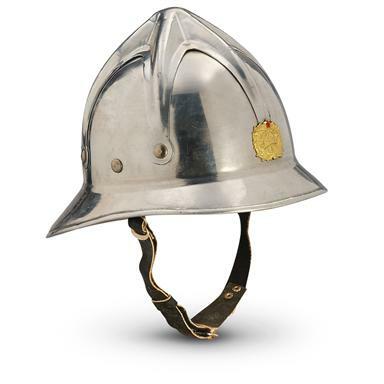 Own this highly collectible, WWII-style metal Fire Helmet. Genuine issue from the Serbian army and features classic detailing from the era. Serbian Military Surplus Fire Helmet, Used is rated 4.6 out of 5 by 12. Rated 5 out of 5 by Dead Horse Larry from Very Cool Mine was in great condition, but the LARGE was a bit small on my 7 1/4 size head. I bought mine when on sale. Rated 3 out of 5 by chief from used serbian fire helmet sized to small, ordered M ,but the size was small,call customer service to exchange for a L .
Rated 5 out of 5 by TravelerV from Great Collectable! It's shiny, It's made of aluminum and mine was in excellent condition. What more can a man want for a collectable in his man cave? Rated 5 out of 5 by John548 from Good Value I was very pleased to add this helmet to my helmet collection. It is unique and was in very good condition. Rated 5 out of 5 by craig from very nice condition After reading the reviews on this helmet I was not sure what to expect. When I received it I was surprised how good of condition it was in. Very happy with this buy. Rated 5 out of 5 by Ray Ray from Perfect Gift for a Firefighter! Bought this for a gift for my nephew, who got his first firefighter assignment.He loved it! And put it on the mantle with all his other memorabilia. Rated 3 out of 5 by Will from Bought 3 of these to give away as employee awards. They were not high polished. They had dirt incrusted and stuck all over the helmet. The picture does not represent the condition of the helmet I expected.That being said, it's still a really neat find a great price. After a few hours of working with the helmets they turned out nice. I would buy this product again. Pointed metal blade is 6x8"l.
The real deal for up-front head protection! The real deal…as worn by troops in Iraq and early Afghanistan ops.